Alice’s Adventures in Wonderland is one of the most famous and best-loved children’s stories of all time. Generations have grown up with characters like the Mad Hatter, the Mock Turtle and the Cheshire Cat, and Alice is equally treasured for its wordplay, its humour and its surreal whimsy. 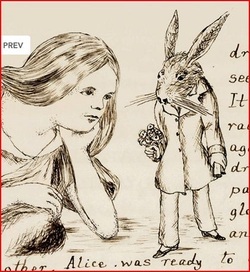 Yet this famous story also exists in an earlier version, personally produced by Lewis Carroll as a Christmas gift for a little girl named Alice Liddell. The Folio Society is proud to publish a facsimile of this priceless manuscript, in a beautifully produced limited edition. The fascinating origins of a classic : The origins of Alice’s Adventures in Wonderland are as enchanting as the story itself. We can picture the scene. It is 4 July 1862, and a small party is rowing down the Isis river at Oxford. The Reverend Robinson Duckworth is manning the oars, and with him is Charles Dodgson – later known as Lewis Carroll - tutor in mathematics at Christ Church. Also in the boat are Alice Liddell, aged 10, and her sisters Edith and Lorina. As they drift down the river, Dodgson tells the girls a story - of a little girl named Alice, who falls down a rabbit-hole to a strange land under ground. Over the next two years Dodgson painstakingly wrote out his tale by hand, illustrating it with his own vivid and maginative drawings. 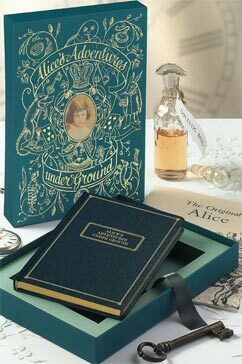 He gave it the title Alice’s Adventures under Ground, had it bound in morocco leather, and presented it to Alice Liddell in November 1864, with the inscription, ‘A Christmas gift to a dear child, in memory of a summer’s day’. A unique insight into Carroll’s vision : Reading this early version gives us a fascinating insight into the origins of one of the most famous stories ever told. Alice’s Adventures under Ground is recognisably the story we know, but it takes unexpected turns. Following the swim in the pool of tears, Alice and the creatures go to a small cottage to get dry, rather than doing the Caucus-race, there is no Duchess but a Marchioness of Mock Turtles, and Alice plays croquet with an ostrich rather than a flamingo. of a classic. 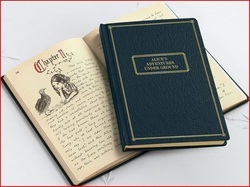 The manuscript is also remarkable for the 37 illustrations, some full-page, by Lewis Carroll’s own hand. He proves himself an artist of talent and imagination, representing his heroine in various fantastical forms: with a long-extended neck, grown to giant size, or swimming in the pool of tears. Friends who read the little book convinced Carroll that it must be published. The story was edited, expanded and renamed, and illustrated by John Tenniel – whose famous images clearly take many of their compositions from Carroll’s originals. Alice Liddell kept her Christmas gift for over 60 years. It then resided in American private collections for some years, until in 1946 it was returned to its homeland, in recognition of British gallantry during the Second World War. A group of delegates presented the manuscript to the British Museum, and it was accepted by the Archbishop of Canterbury on behalf of the nation. It is now one of the British Library’s most cherished literary treasures. Only 3,750 copies were printed, each one numbered by hand on a special limitation page.